If BC Liberals lied before, can we believe them now? “Premier Gordon Campbell and Finance Minister Colin Hansen announced the change in Vancouver Thursday, presenting it as a revenue-neutral way to simplify the system for business and encourage new investment. “…Hansen said the implementation will result in a drop in revenues to the province initially, moving to a slight net increase in later years. Of course, Campbell and Hansen spoke from extensive briefing notes prepared by the vast squad of minions employed by the Premier’s Office and the Ministry of Finance. The statement that HST would be revenue neutral was a well considered element of the presentation. We now can examine the correctness of the assertion. Since the politicians had unlimited resources to consider HST effects, they should have been reasonably accurate about the resulting revenue changes. If the numbers were close, say within a couple hundred millions of dollars, they might earn a pass. If the numbers show a distinctly different result, then either Campbell and Hansen and support staff were thoroughly incompetent or they were flat-out liars. 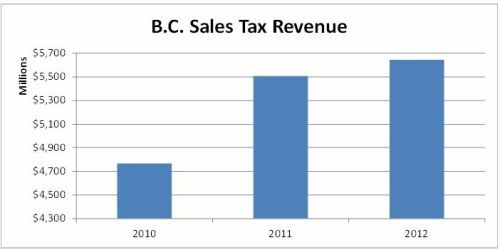 According to public accounts for the fiscal year ended March 31 2010, provincial sales tax revenue was $4.76 billion. In fiscal 2011, with nine months of HST, sales tax revenue was $5.51 billion. Rather than dropping as Colin Hansen predicted, it was up more than $700 million. A year later in 2012, HST was $5.64 billion, an increase of 18%, almost $900 million from 2010. Of course, one other factor to consider is tax incidence, the effect of a particular tax on the distribution of economic welfare. We were told that, by moving to HST, businesses in British Columbia would save about $2 billion a year. Since HST actually brings in substantially more money and business was largely relieved from paying the tax, the policy move added almost $3 billion a year to the tax burden of consumers. Because of ineffective competition laws, consumers are already paying prices substantially higher than paid by southern neighbours. The combination effect is considerable. No wonder people say that BC Liberals provide a business friendly environment. Speaking of lies, didn`t the successful referendum to remove the HST also demand that the previous exemptions return..
That too is doubtful, according to Jordan Bateman..
Exempt items of the past will now be taxed. I urge everyone this year to tell all their loved ones and friends to not give them any gifts this holiday, but instead pay off debt. We should use this year to pay off our over extended debt loads and lower our burdens. This will save everyone money in interest and not support cheap labour in China. And this is one reason why BC is the most expensive place to live canada. And what are they doing with this windfall? Reducing royalties and building roads in the northern gas fields. That's an amazing increase, despite the underground economy and cross-border shopping, where even day-trippers get to roll back into Canada with $200 in purchases (per person) and not pay a cent in HST. Who's been paying more than their share of the HST? Anyone who isn't mobile enough to get across the border: the poor, the aged — and those living in central and northern BC… or on the islands. Revenue neutral is a misnomer. It is NOT revenue neutral for me, business or the Government as the chart shows. 3 billion?? The Government is making out like bandits over the old PST/GST. Business never had it so good but have not reduced prices or hired more people. I had many discussions with friends over this tax and if you made 30K or less you got enough rebates, although paying out up front was a problem, and if you made over 75K you had enough to eat the increased cost. The middle class, remember us, pay through the nose. They are still playing games in that they are bringing in an “improved” PST. The referendum was to return to what we had. I cannot wait to get rid of this corrupt bunch. Great Blog Norm. I come here daily and love the articles and comments. Even Martyn Brown admitted on VOBC November 15th that the HST was a huge tax shift from business onto consumer. We all knew that with our own personal budgets. That's why the referendum succeeded. I hope everyone remembers who instituted the HST and who has not removed it since the successful referendum come the next election. If the BC Liberals had noses like Pinocchio, then plastic surgeons in BC would have a boom on rhinoplasty surgeries. Of course, PST would probably be charged on that too. They're talking about consumers paying PST in much the same way as we pay HST. The next shoe to drop is their system of relieving businesses of paying reintroduced PST. A source tells me that the provincial sales tax system will have near identical effect to the current tax regime. Making it so has been why they've taken so long to eliminate HST and shift back to PST. Middle class taxpayers will get the worst choice of all. The shift from business to consumer will be complete without the administrative conveniences of the one tax system. Solution…Order in council, by the new incoming government to “not” implement the “new” PST until a thorough, review is conducted into whether or not the legislation will be in the “public”..albeit..”taxpayer” intrest. The allowing of implementation, of any of this governments political agenda, within the next 6 months, without a severe dose of public scrutiny, would be a very wise decision. Anything the current administration tries to do, should be viewed with a critical analysis. It would appear that the Budget being brought down in February, would be the time when this, would all come to the fore. Unless of course the Legisature does not sit and an early election, by some stroke of luck, occurs. One can only hope. Lets hope the BC NDP, the most probable incoming government, get this message and act on it. We all knew that at the time but the Liberals and sponsoring big businesses chose to treat us as ignorant idiots, saying we would be better off because consumer prices would drop. Did you notice that on your last shipload of coal?